Our passionately designed space & panoramic city views makes the perfect backdrop for your dream rooftop event. 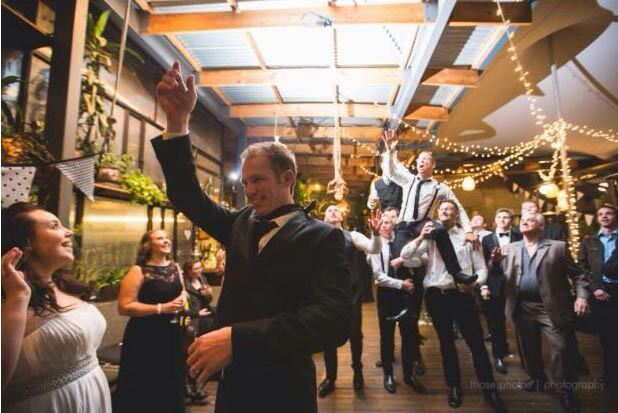 There's only a tiny section of our rooftop where you can dance in the rain, as for the rest, we've got you covered! Dress it up or add your touch to our unique "Boho Urban Eco Style" for Weddings, Birthdays, Product Launches, Corporate Functions and Networking Events. Lose yourself in our picturesque views amidst Johannesburg's metropolitan charm. We have amazing catering partners that can assist with all your catering needs as well as a fully stocked bar with some of the best cocktails in Jozi. Make an event enquiry today! 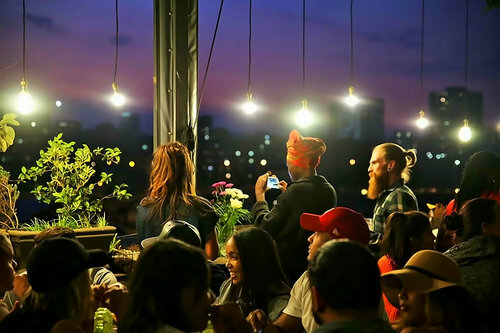 Impress and astound your guests, delegates or clients with the thrill of a rooftop event. Our super capable event planners are eager to team up with you to deliver an experience to remember. The spacious terrace offers the ideal space to showcase your newest offerings to your partners. Leave them gasping amidst Joburg's Skyline. What better way to broadcast in the City of Gold than to have the splendor of its cityscape as a backdrop? Coupled with our lush plant life, the Living Room is guaranteed to deliver as the perfect location for your press event. Plan a function that will take your co-worker's breath away. Reflecting on the months gone by with such a spectacular panoramic view will undoubtedly end the year on a high note. Ideal for both casual and formal set ups, from birthdays to engagement parties to graduations or anniversaries, come and celebrate your special occasions in our beautiful rooftop jungle. A skyline setting for the night of your life. We are seasoned professionals at hosting wedding celebrations, so it's no surprise that numerous couples have chosen to make their vows in the middle of Johannesburg's throbbing metropolitan heart. Right here with us. Our own events began when we were still busy building the space as a functioning café. We'd construct and plant all week long, then throw open our doors to celebrate the weekend. The practice grew into an institution of sorts, drawing a following that keeps on growing. Feel instantly at home with our eclectic mix of ages, cultures and music! Every Saturday that we are not booked for an event, we gather up all our fancy dress and favourite DJs in order to throw a public party! We host live performers and serve tasty treats from our latest menu releases. Keep an eye on our Calendar so you can catch the next one! Our weekly Sunday events have garnered quite the following and have since given birth to new spin-offs: Sunday Jive, Photosynthesis, Chef on Decks, Fresh Produce. These relaxed afternoons are now a storied part of our down-to-earth-in-a-rooftop-oasis culture. Living Room hires out the venue to external organisers who wish to host parties / functions in our venue that they sell tickets too. This is a separate structure to our normal venue hire due to the operations. For any queries with regards to hosting an event like this, please email our Sales & Marketing Team on marketing@livingroomjozi.co.za.